When you have surgery or an invasive diagnostic procedure, you will receive some type of anesthesia or medication to help you remain comfortable and pain-free during your procedure. A member of the anesthesia care team at Wooster Community Hospital will meet with you prior to your procedure to explain your anesthesia options and answer any questions you might have. There are several different types of anesthesia. The type you will receive depends on the surgery or procedure you are having, your age, and your health. 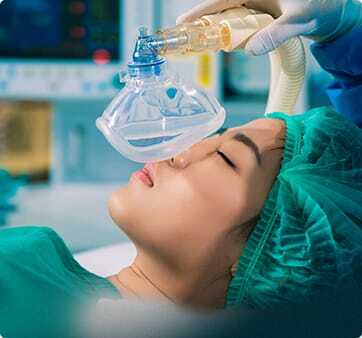 General anesthesia: This type of anesthesia is used for major surgery. It is delivered through a mask or intravenous line (IV), and you will be unconscious for the entire procedure. You may also have a tube inserted down your throat to help you breathe. An anesthesiologist or nurse anesthetist will monitor your heart rate, blood pressure, breathing, and other vital signs throughout your surgery to make sure they are normal. IV sedation: This type of anesthesia is delivered through an intravenous line. You will relax, and – depending on the level of sedation you receive (minimal, moderate, or deep) – you may remain awake or you may fall asleep, but you will not lose consciousness. IV sedation is typically used for minor surgeries or shorter, less complex procedures. Other names for IV sedation include monitored anesthesia care, conscious sedation, or twilight sedation. Regional anesthesia: This type of pain control is used to numb a large section of the body, such as during childbirth. It is delivered through an injection (spinal block) or catheter (epidural) placed in your lower back. You will remain fully awake, but you will not feel anything in the area that is being numbed. Local anesthesia: This type of pain control is used to numb a small area of the body. It is injected directly into the target area. You will likely receive local anesthesia if you are having a skin biopsy, minor excision, or stitches. AT WCH, we have physician anesthesiologists and nurse anesthetists on staff. On the day of your surgery or procedure, you will meet with an anesthesiologist to review the type of anesthesia you will be having and discuss post-operative pain control. We know that having surgery is scary, and our goal is to ease your anxiety and worry so you can focus on your recovery and healing.